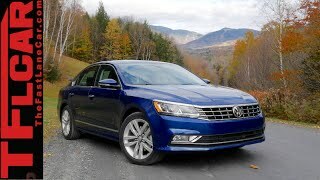 As stated by the company the all new Volkswagen Passat 2016 is designed for the American lifestyle. Now this might bring several expectations in the hearts of American buyers, but we have a lot in mind still incognito about the new member in the Volkswagen family. This made is inclined towards having a look and here is what we noticed. 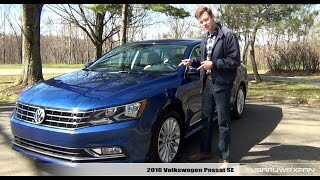 Let us have a look together, at the review of Volkswagen Passat 2016 to know more about this latest Passat model. The interior of Volkswagen Passat 2016 resembles a lot ‘layout wise’ to the model it replaces. I believe it’s a positive signature as from our point of view it didn’t need much of refinement. However cabin has been given a touch with the higher quality materials replacing the cheap ones found in outgoing model. The changes so inculcated aren’t confined to the material and the touch luxury. The new model also gets the latest Volkswagen infotainment system which is now compatible with the Apple CarPlay and Android Auto. Hearing it from company they claim that the new system features faster response time as in comparison the previous model. 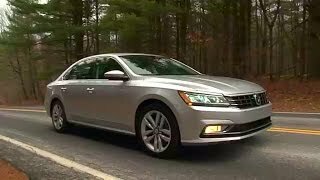 In all rounding up the interior details of Volkswagen Passat 2016 I would say, it gets more luxurious, comfortable and tech oriented. 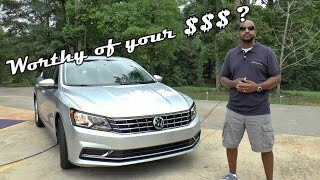 Just like the interior, the exterior of Volkswagen Passat 2016 gets some cosmetic changes which separate it from the previous model. Starting with the front fascia of the model, it has slimmer headlights and new European grille which gives more luxurious look. Beneath the setup is a massive air vent delivering fresh air to the engine while for the wheels are two spaces alongside the bumper. However these aren’t the major changes, the change in the model comes with the first time introduced R-Line package for the US buyers. The package adds set of 19” wheels and black accents that are commendably noticed in the front bumper. The model also comes with a new rear diffuser and rocker panels which gives the touch of aggression. 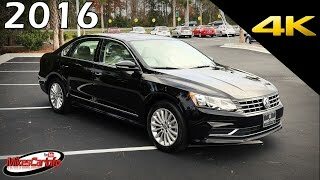 In all rounding up the exterior details of Volkswagen Passat 2016 I would say it has luxury, aggression and refinement that will easily make it distinct. Powering the new Volkswagen Passat 2016 are three engine options; a 2.0 TDI, 1.8 liter Turbo and 3.6 Liter VR6. The power output is still not revealed for all of them but as stated by company the later two engines will be cranking total output of 170 hp and 280 hp respectively. Talking about the performance figures of Volkswagen Passat 2016 they are yet to be shared and we expect the same to be unveiled very soon.